WASHINGTON — Avoidable miscommunication between U.S. air and ground forces led to a “friendly fire” incident in Afghanistan that killed five U.S. soldiers and one Afghan in June, according to a military investigation report. The incident was one of the deadliest friendly fire episodes of the war, which began 13 years ago next month. The report released Thursday by U.S. Central Command, which oversees operations in Afghanistan, cited a collective failure by soldiers, commanders and air crew members to execute the fundamentals of the mission. As a result, the five Americans and one Afghan were mistaken for the enemy and were attacked with two laser-guided bombs from a B-1 bomber. A two-star Air Force general led the investigation. Many details of the report were blacked out before its public release. The B-1 bomber crew was executing an authorized order, but the crew members were faulted by investigators for not taking reasonable precautions to ensure they knew where friendly forces were located. Despite discrepancies in reported U.S. troop locations — suggesting that something may have been amiss — the air crew did not take necessary steps to validate its information before launching the bombs, the report said. Unidentified members of the ground forces, which included an Army Special Forces unit, were faulted for incorrectly communicating some troops’ positions and for not knowing that the B-1 bomber’s targeting gear is incapable of detecting friendly marking devices of the type used by U.S. ground forces in the June 9 operation. These failures led to the mistaken conclusion that the targeted U.S. and Afghan soldiers were insurgents. “The key members executing the close air support mission collectively failed to effectively execute the fundamentals, which resulted in poor situational awareness and improper target identification,” the report concluded. In response to the report, the Army said it is considering whether any tactics should be changed to minimize chances of repeating mistakes that led to the deaths. It also forwarded the report to the commander of Army Special Operations Command to decide whether any punitive action should be taken. The Air Force said it would study the report before deciding on any disciplinary action. The June incident happened in Zabul province in southern Afghanistan at the end of an operation led by the Afghan army and supported by Army Special Forces. Their aim was to disrupt insurgents and improve security for local polling stations in the Arghandab district in advance of the June 14 Afghan presidential runoff election. From an altitude of about 12,000 feet, the B-1 bomber was providing what the military calls close air support while U.S. and Afghan ground troops were moving out of the area at the conclusion of their operation. The six soldiers who were killed had moved from their group’s main position in a valley to higher ground on a ridgeline in order to maneuver on insurgent forces. Muzzle flashes seen at their position on the ridgeline were mistaken for signs of rifle fire from insurgents, in part because the movement of the six was not properly communicated to those coordinating with the B-1 crew. And when the B-1 crew said their targeting pods had detected no U.S. marking devices at that location it was decided that targets must by insurgents. “While this complex combat situation presented a challenging set of circumstances, had the team understood their system’s capabilities, executed standard tactics, techniques and procedures and communicated effectively, this tragic incident was avoidable,” the partially censored report concluded. The five Americans killed were Staff Sgt. Jason A. McDonald, 28, of Butler, Georgia; Staff Sgt. 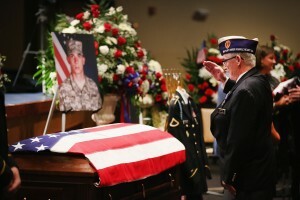 Scott R. Studenmund, 24, of Pasadena, California; Spc. Justin R. Helton, 25, of Beaver, Ohio; Cpl. Justin R. Clouse, 22, of Sprague, Washington, and Pvt. Aaron S. Toppen, 19, of Mokena, Illinois. The Afghan killed in the attack was identified by Central Command as Sgt. Gulbuddin Ghulam Sakhi. The deaths were an example of how battlefield mistakes caused by confusion or miscalculations can have profound consequences. Friendly fire is a problem as old as warfare, and although technological advances, training and combat experience have lessened the frequency, it still poses a threat to U.S. and allied forces. “War is a very human endeavor, and mistakes inevitably will occur,” retired Army Col. Peter Mansoor, an Iraq war veteran and now professor of military history at Ohio State University, said after the June incident.